"80% of organisations are planning on implementing Unified Communications and Collaboration solutions within the next 2 years, and 78% of them have available budget to do this." This is the findings of a recent research paper conducted by Ovum and Dimension Data which also states that the drivers are now not entirely cost centric, and are actually now more aligned to the key benefits that these solutions bring to the table and what it can enable business to achieve - read an interview with the principal research analyst and find the research document here. There has also been a notable move to managed service models. Something that here at Britannic Technologies we are very pleased to hear as it is what we are experts in, but the real reason behind that shift is the understanding that these communications tools can be purchased as a service. Organisations no longer need to purchase expensive equipment with big capital expenditure, they can have the service offered on a per user/license basis, making it financially easier to budget and afford. There is also the added bonus that comes with managed service models that support, and technical expertise are on hand outside of the organisation - strengthening the resources available. The Cloud is a very strong option for business. It is mature enough to handle enterprise scale communications infrastructure in a fully resilient and available environment, and it has the ability to flex and scale simply... and more than that, it can be managed so the stress can be removed from the equation. We have recently been added to the Datacentre Solutions Awards Finalists for an installation exactly like this, where we were able to provide a 46% cost saving, while improving the functionality of their existing communications platform - read the case study. These are just a few of the immediate benefits. What you can also expect to find is that by giving your employees the freedom to work how they want to work, and collaborate how they want to you will increase moral and a happy work force is a strong and motivated one! There are hazards however, and by granting your employees the freedom to work remotely, how can you guarantee that they are there? IM and Presence solutions are on the rise, with Microsoft Lync being a strong player in this game. Britannic actually integrate your phone system with Lync now to provide true visibility (on phone, busy, in a meeting, do not disturb) voice, and remote call control and add an extra string to the already powerful Lync bow. The real trick is getting the balance right and implementing the strategy in such a way that you can maximise your employees potential and realise your business vision. Are you thinking about implementing UC&C? What services and systems are you looking at? What model do you think will be right for you? 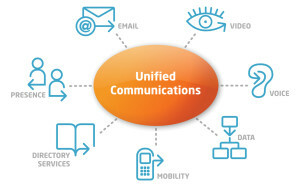 Do you already have a UC&C solution in place? How is that working for you and what advantages/disadvantages have you seen?